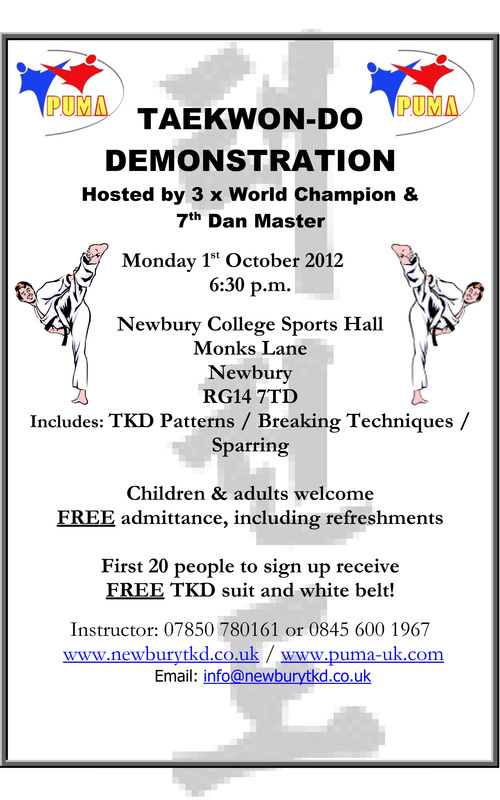 We have decided to change the date of the demonstration at Newbury Taekwon-do. The new date is the 28th October starting at 6pm. At the demonstration we will have Little Pumas (4-6 year olds) Junniors (7-12 year olds) and adults. So come along and see what we are all about. We have a new little Puma class starting soon at Newbury College, so we will have little Pumas at Northcroft and at Newbury College. We'd love to hear from you if you are interested in coming along, have any questions about what we do and about joining us just go to the contact us page and ask away. This weekend has played host to the 2nd P.U.M.A. World Open competition in Swindon. The event was a huge success, with a number a Newbury students competiting and receiving medals, and supporting the smooth running as officials and stewards. A highlight of the weekend was the promotion of P.U.M.A. chairman Master Gayle to 8th Degree Black Belt, a great honour greatly deserved. The colour belt patterns and saju jirugi, saju makgi, have been added to the Newbury Taekwon-Do website. Each pattern page contains the pattern meaning and a video of the pattern performed by a black belt. The videos have been embedded from the ITFTuls YouTube channel. Find the patterns page here. Black belt pre-grading this month, good luck to those taking part. Also referee and umpire courses next month, speak to the instructor to sign up if you're interested. This months newsletter contains a review of area championships, and results of December colour belt grading. Announcement of the Berkshire area competition, results from the P.U.M.A. British championships, and report from the winter camp.